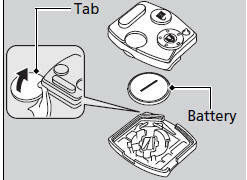 If the indicator does not come on when the button is pressed, replace the battery. 1. Unscrew the cover with a small Phillipshead screwdriver. 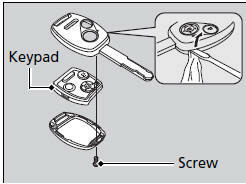 ► Wrap the small flat-tip screwdriver with a cloth to prevent scratching the transmitter. ► Wrap a coin with a cloth to prevent scratching the transmitter. Replacement batteries are commercially available or at a dealer.